Junior guard Jon Elmore dribbles around MTSU guard Tyrik Dixon. He tallies 19 points on the night and scores double figures in his 53rd consecutive game. 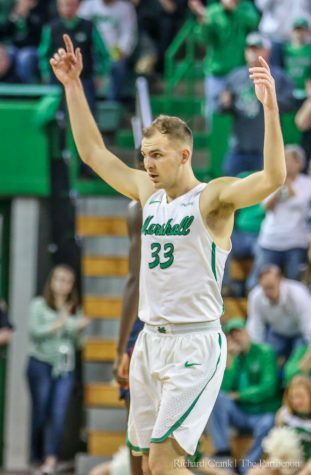 Marshall men’s basketball (13-6, 4-2 C-USA) won decisively against Conference USA-leading Middle Tennessee (13-5, 5-1 C-USA) Thursday evening at the Henderson Center. 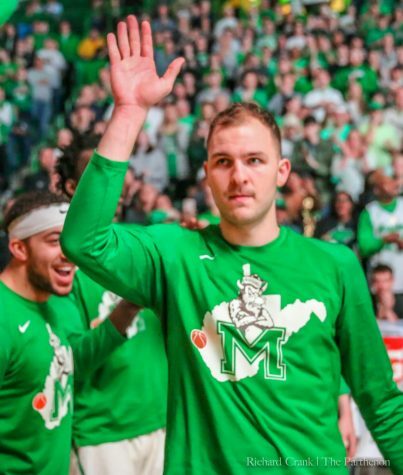 The Herd improves to 11-1 at home this season after its 73-63 win over the reigning two-time conference champion. 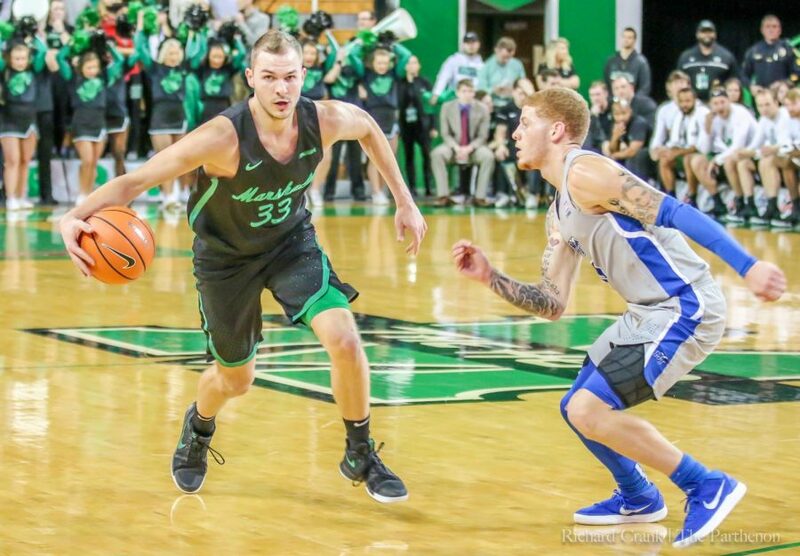 The Herd handed the Blue Raiders their first in-conference loss this season in front of a fervent 5,320 fans, and with the return of junior forward Ajdin Penava, there was a playoff atmosphere in the Henderson Center. 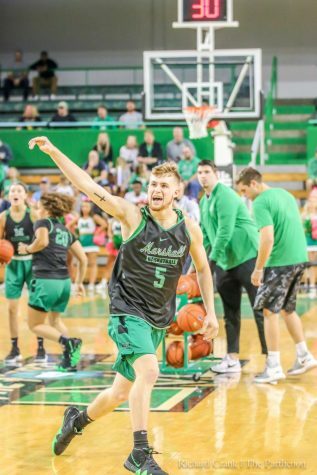 Due to an ankle injury, Penava missed Marshall’s last two games at Charlotte and Old Dominion, as well as most of the Western Kentucky game, but he said he was happy to return. Penava is the nation’s leading blocker thus far this season, with 82 total blocks and 4.82 blocks per game. 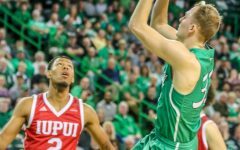 He continued his defensive dominance Thursday, registering six blocks against the Blue Raiders. Penava also scored 17 points and had a team-high seven rebounds. 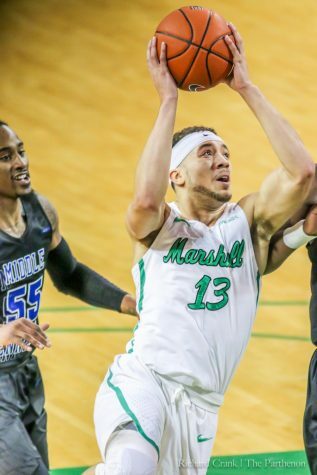 Freshman forward Darius George was also back in the rotation for Marshall after he was sidelined with a foot injury. Junior guard C.J. 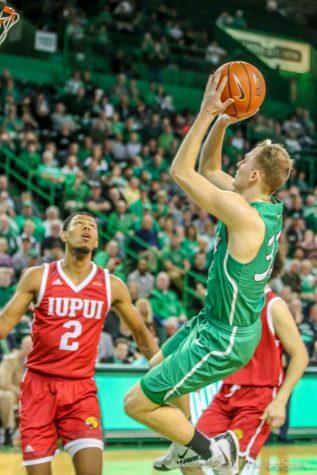 Burks was the Herd’s leading scorer for the third consecutive game with 25 points. Burks was the game’s only player to score more than 20 points. Burks and Elmore are currently the best scoring duo in the country, as they combine for 43.7 points per game. 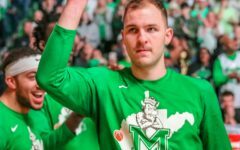 Elmore had 19 points against Middle Tennessee. “We’re starting to get everybody back together and see what we’re capable of having when we have all the pieces,” Elmore said. 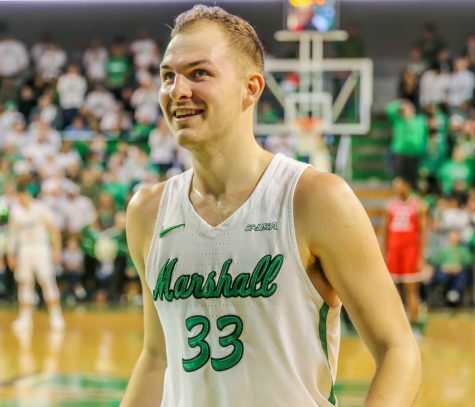 Marshall’s defense stood out during the game, as it held the Blue Raiders to an uncharacteristic 40.3 shooting percentage from the field. Giddy Potts and Antwain Johnson led the Blue Raiders with 15 points each. Nick King added 14. Middle Tennessee’s 61-57 loss to Florida Atlantic is the only game this season in which it has scored less than 63 points. “We got the number one shot blocker in the country. I think that speaks of defense. We got two of the top six or five people’s in steals (in C-USA),” D’Antoni said. D’Antoni said there’s more to come from his team. 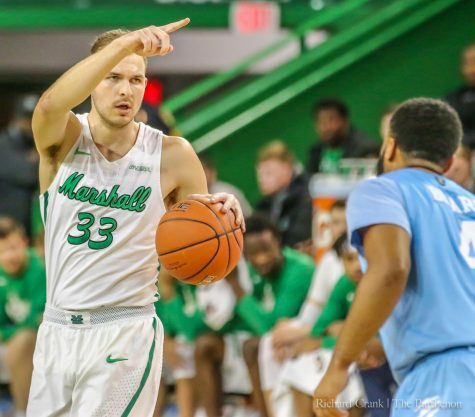 The Herd takes on UAB on Saturday at the Cam Henderson Center. “We’re looking forward to bouncing back and getting back at it Saturday,” Elmore said.